Forget tough questions—they taught viewers to worship celebrity, no matter what. The end of Larry King Live, after 50 years and a steep drop in ratings, was inevitable in a cable news climate that values mindless partisanship over mindless nonpartisanship. In contrast to the likes of MSNBC’s Keith Olbermann and Fox’s Glenn Beck, CNN’s middle-of-the-road tack was flailing. King’s farewell aptly coincided with the end of another institution in softball interviewing: The Oprah Winfrey Show, that stronghold of cheery neutrality and generic goodwill. Perhaps this is why, in a promo for Piers Morgan Tonight—which will take Larry King Live’s time slot on CNN beginning January 17—the tagline “a bit dangerous” flashes as Morgan folds his arms decisively and casts the camera a knowing glance. It’s a clear attempt to frame Morgan as precisely what King (and Oprah) was not: an instigator, a risk-taker, a provocateur. King’s departure was part of a large-scale reshuffling at CNN. The network fired its president, Jonathan Klein, in September; Klein’s successor, Ken Jautz, had been the head of CNN’s tabloid-esque sister channel HLN and, in 2006, was the first to put Beck on television. In October, the left-right he-says-she-says Parker-Spitzer replaced the straight-talking Campbell Brown. This was all CNN’s attempt to catch up with the other model of talk on television, the O’Reilly Factor brand of partisan grouchiness, of talk as conflict. That model is often little more than contrarian theatrics substituted for real analysis and debate, but this is no reason to get sentimental about the King-Winfrey model of soft dialogue. It was toxic in its own right. It was, for a start, contentless—the mechanical application of the human-interest angle to everybody, regardless of their station or their substance. And it was an exercise in voyeurism, treating politicians like celebrities, prodding them with personality questions and giving them free rein to project their best selves. Of course, the success of the King-Winfrey formula is owed in part to the fact that it was designed for the purposes of promotion and public relations; King and Oprah landed big interviews because guests were sure to be appreciated and unchallenged. All stars were guaranteed their version of themselves. They could push a product, or, if they were scandal-ridden, they could find “redemption”. Ideally, an interview requires a certain distance: an immunity to whatever the interviewee is pushing and a resistance to hype. Though it need not be adversarial, some skepticism is always good. But, when it came to famous people, both King and Oprah were hopelessly sold. 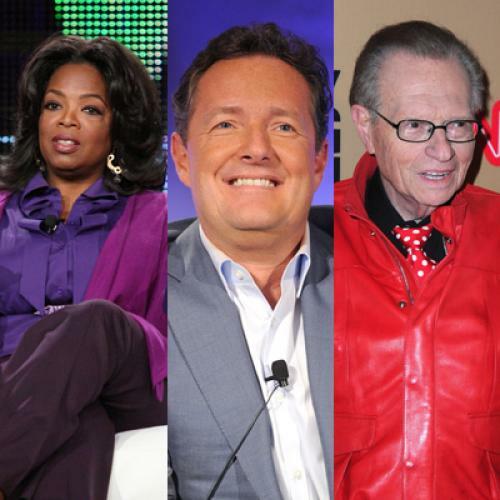 As Larry King Live and The Oprah Winfrey Show both leave the air, their legacy is the same in one major respect: They taught the American viewing public deference to celebrity in all its forms, as pop stars and world leaders were handled with the same blend of nosiness and awe. Here is one example. It happened that on both Oprah and King, former D.C. public schools chancellor Michelle Rhee recently appeared alongside John Legend, who wrote a song for the pro-school reform documentary Waiting for Superman. Rhee spoke briefly, and then, King asked: “Do you agree, John?” Oprah, too, seemed more interested in picking Legend’s brain than Rhee’s. “John believes that this crisis is the civil rights issue of our time,” Oprah crowed. “You are so right! It is. Tell us why.” In neither case was there any acknowledgment of differential expertise or weight given to one testimony over another. Legend and Rhee sat side by side, their insights on education jointly consulted. Well-versed in the pet cause of school reform as Legend may be, the effect of such an approach is to confuse viewers about what is serious and what is not. All real issues at stake get drowned in the bath of general good feeling. Needless to say, Oprah Winfrey and Larry King are in many ways distinct. She is a New Agey guru, luring millions into the cult of self-betterment. Her new cable network, OWN, is built around her earnest creed of “living your best life.” Lately, King’s cheerful passivity seemed more a product of senility than a stylistic choice. Oprah is all matriarchal fortitude and manic high spirits; King is sedate, barely blinking, a kind of geriatric alien. But, as interviewers, they are both, in their own ways, without temperament—Oprah in her cardboard positivity, King in that near-invisible radio host way, with his anemic questions and total lack of slant. The appeal for viewers, in both cases, was the casualness of the rapport and the vicarious close-up exposure to stars. For Oprah, it was always clear that the encounter with celebrity was a religious experience. Seeing John Travolta or Julia Roberts stroll onstage was enough to send her into an ecstatic fit. King, albeit less hysterically, subscribed to the same hype. He came most alive when asking Lady Gaga whether she considered herself an icon or Paris Hilton what she ate in jail. He had a sort of happenstance approach to actual news: If Ross Perot declared his presidential candidacy or Rabin, Arafat, and Hussein showed up to discuss the Middle East peace process, fine—but there was no exigency, nothing heavy or dark, no push of any kind. The celebrities themselves were the event, and King was happy to let them roam. Even in King’s most historic interviews, he played the gentle therapist with an anthropological interest in feelings and moods. “Mr. President, thank you for coming. Do you like coming to New York?” He actually asked those questions of Mahmoud Ahmadinejad in 2008. “How are you doing? This has to be the worst period of your life,” he said to Chris Brown in the rapper’s first interview after pummeling Rihanna. He presided over the Gore-Perot NAFTA debate in ’93 as if it were a schoolyard spat. For Oprah and King, everything was trivial, and a sitdown with any famous person was an excuse to shoot the breeze. “Have you endorsed a candidate before?” King asked. Because she knew him personally: As if personal acquaintance with a celebrity were the highest proof and an ideological end in itself. Her politics were built less on principles than on proximity.